Gender-neutral bathrooms: Washington, D.C.’s Twitter campaign for trans rights. For most of us, using the restroom doesn’t evoke fears of discrimination or violence. But for many in the trans community, gender-segregated restrooms are a place of dread. What should be an ordinary, private action can turn threatening at any moment, with danger potentially lurking behind each stall door. And those unnecessary gender-specific stick-figure labels don’t make the environment any trans-friendlier. For that reason, in Washington, D.C., they’re illegal—at least for single-occupancy restrooms. And as part of its fantastic efforts toward greater trans inclusivity, the city has just launched a Twitter campaign to help enforce the legislation. The new #safebathroomsDC hashtag campaign allows Twitter users to share photos, locations, and business names when single-occupancy restrooms are illegally labeled with gender-specific signage. (There’s nothing keeping users from making these photos selfies, either.) While most businesses simply comply with initial requests to change the signage, each failure to do so is a Class 3 civil infraction with a potential $500 fine. According to the District of Columbia Office of Human Rights, taking 30 seconds out of your happy hour to tweet about toilets can really make a difference to building a more trans-friendly city. Previously, complainants had to complete a tedious official report in order to bring attention to alleged infractions. By creating a system that streamlines the process and also incorporates social media, D.C.’s government is empowering citizens not only to take action but also to create public awareness about trans issues. 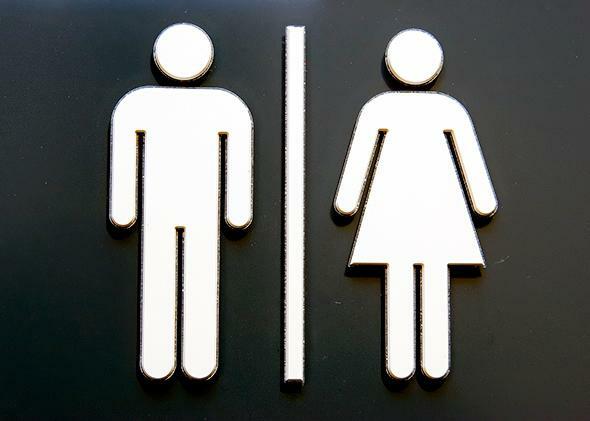 After all, many business owners may simply be unaware of the bathroom signage ordinance. With the new effort, everybody wins. And for those of you who may be slow to warm up to the idea of bathroom equality, non-gendered single-occupancy restrooms don’t just help trans people: Non-specific signage means that those long lines for the women’s room while the guys breeze in and out of the facility next door are now a thing of the past. Everybody will wait in line together, as equals. All bathrooms should be gender-neutral.